REALITY . . . VS. 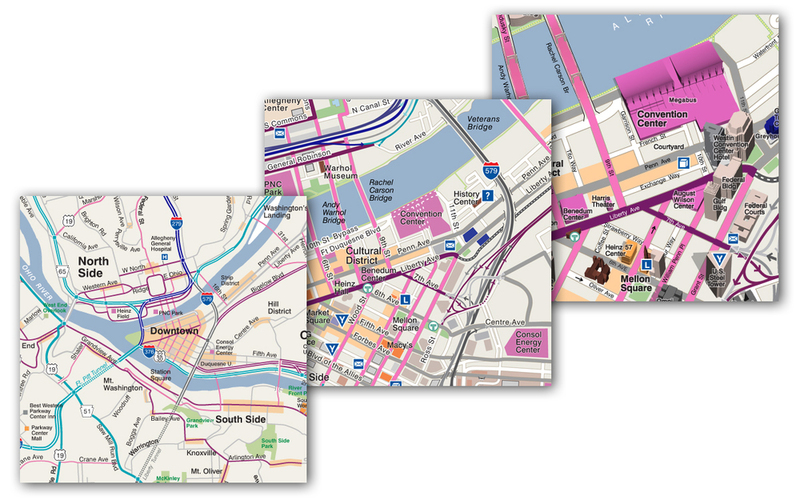 REALITY FIGURED OUT — Informing Design, Inc.
There’s a map arms race out there. Google Maps has its Streetview and Google Earth and its close-up 3-D modeling of buildings; Apple Maps has its own roving vans out there snapping street level pictures as fast as they can, and it’s expanding its Flyover system (that merges aerial photos seamlessly into 3-D modeling) to more and more cities. All of it is visually stunning, all of it an amazing technical achievement . . . except, aren’t they missing something? Reality is confusing. More of it, unfiltered, is just more confusing, right? I mean, what they are doing is pretty and fun, but is it helping you understand Paris any better? There’s reality, and there’s reality figured out. The latter is a “reality” that lets you see around buildings and over the horizon in a way that enables you to “get” the relationship between the streetview right in front of you and the array of destination options in the street network out of sight. Welcome to the map, supercharged. Informing Design has been researching that very question for nearly two decades, and its latest answers may surprise you. Most map researchers assume that road maps are not easy to understand at a glance, that it takes serious effort to work out how a street network is organized, so the less detail the better. Informing Design not only challenged that assumption but found that a lot more reality can be packed into a road map and still have it all be grasp-able at a glance, though only if is rendered in a very particular way. That is, only if the map is de-complexified via Informing Design’s proprietary approach to rendering street networks (see the whole story of this approach in the “Gridding the Ungriddable” case study). The result of this untangling de-complexification is a series of maps of ever-finer scale that culminates in stunning 3-D views full of detail at the pedestrian level. What this means is that not only is the immediate area graspable at a glance, but that the long range effects of local actions are also immediately apparent by zooming out. A city can be explained from 1,000 feet up in a way that holds up at the view from 6 feet up. City-wide maps in an app or on the web suddenly make perfect sense with the local, full-of-detail 3-D view on a sidewalk map kiosk. We did it in Pittsburgh, we did it in Winnipeg, we did it in Winston-Salem, we did it in Nashville. We even did it in tiny Cambridge on the Eastern Shore of Maryland. And we’re now working on an app that can bring that experience to every major City in North America.